Lead nurturing is the process of building relationships with prospects over time while shaping their interest in your solution to a certain threshold, or lead score, until the lead is ready for sales. It’s similar to progressing from dating to marriage. First, there’s initial contact where one person expresses interest in another. If the person being courted is too aggressive in their response it could be a turn off to the interested party. Fortunately, there are dating and lead nurturing best practices to adhere to. Whether dating or trying to sell, it’s vital to deepen the relationship over time and know when to commit more. According to Brian Carroll, author of Lead Generation for the Complex Sale, 95% of website visitors are not ready to speak to sales. They may be just researching your industry and your company. However, studies show sales-readiness of website visitors will increase over time. In fact, 70% of those visitors will eventually buy from someone – including your competition. Unfortunately, most companies don’t realize this outcome. What problems does lead nurturing solve? If your lead generation process is similar to most companies, once a contact fills out a web form two things occur. First, the contact is loaded into a CRM system, such as Salesforce.com. Second, a sales person qualifies the contact with a phone call or email. If the contact does not seem like a short term sale for the sales person the lead is ignored and deemed “unqualified”. No further interaction occurs between the company and the contact. Consequentially, lead generation processes become inefficient and “rusty” over time while sales people develop a stigma about the quality of marketing’s leads. Research supports this trend as 80% of all marketing leads are unused, which is a waste of 80% of marketing’s budget. How will lead nurturing help you? To maximize ROI on your marketing dollars, it is imperative that interested prospects remain in close communication with you and your company well beyond the initial point of contact. Instead of dropping unqualified leads into a black hole, companies should build a relationship with the lead through a series of scheduled communications. By doing so, companies shape the preference of their potential buyers and stand a better chance of winning a prospects business. Decrease the percent of leads generated by marketing that are ignored by sales from 80% to approximately 25%. Raise win rates of leads generated by marketing 7% points higher and reduce “no decisions” by 6%. Have 9% more sales representatives make quota and decrease ramp up time for new reps by 10%. Increase efficiency as nurtured-prospects buy more, require less discounting and have shorter sales cycles than prospects that bought but were not nurtured. Generate 50% more sales-ready leads at 33% lower cost-per-lead. Number 5 is very important. Lead nurturing allows marketers to maximize return on their most valued asset, a marketing database. Marketers spend lots of money collecting new leads to build up their database. Rely less on adding uninterested contacts with incomplete information to your database and focus on building a high quality database you can nurture. By eliminating dependencies on new contacts and leveraging existing leads, marketers lower cost per lead. cultivate and nurture contacts over time so those contacts remember your brand when the need arises. 1. Create content that tells a story, from start to finish. 2. Don’t focus nurturing content on your product; rather, focus content on what your product does for your prospect. Communicate your message using 3rd party content, case studies, white papers, eBooks, Podcasts, webinars and tradeshows invitations. 3. Select a time line and frequency for your nurturing program. Most programs last 12 months on average but vary based on sales cycles. Identify how long your typical sales cycle is and use that as the duration of your nurturing program. Most programs nurture their leads one time per month on average. 4. Keep lead nurturing simple. Experts suggest 80% of the benefit of lead nurturing is achieved by the first 20% of effort. Refrain from creating too many lead nurturing programs / tracks. To start, create only one program per industry relevant to your business. For example, if most of your customers are in the finance and telecom industry create two programs; one with content relevant to finance and the other with content relevant to telecom. Below is an example of a lead nurturing program with 12 nurturing events over 12 months. Once your lead nurturing program is up and running, you’ll need to start prioritizing and capturing your leads. First, you have to define what a sales-ready lead is. A sales-ready lead is a contact that meets your ideal profile and/or demonstrates interest in your solution commensurate with buying signals. By using lead scoring, companies have the opportunity to measure the relative levels of sales-readiness of one lead versus another. Combining lead scoring with real-time lead tracking technology allows companies to notify their sales team of a hot lead at the exact moment a nurtured-contact interacts with marketing collateral. For example, if a contact is sent an email message with links to an article on your company’s website, you’ll be notified in real-time via email or desktop software when the contact clicks the link. This process creates a closed-loop email marketing system, which most email marketing programs do not have. We suggest defining a sales-ready lead and your lead nurturing programs in a Service Level Agreement (SLA). SLAs are used to broker collaboration and agreement between sales and marketing. Remember, make sure you execute your lead nurturing plan and stick to it. To quote Thomas Edison, “Success is 10 percent inspiration and 90 percent perspiration”. A lead nurturing program similar to the one above can be fully automated and executed using revenue generation software from Lead Liaison. We welcome your feedback, comments and suggestions. What lead nurturing best practices do you suggest? The CMO Council sited 38% of Chief Marketing Officers (CMOs) say sales and marketing alignment and integration is a top priority. However, only 30% have a clear process or program to do something about it. With only 38% of CMOs making alignment a top priority, we can assume approximately 1 out of every 3 organizations recognize the issue but few take action. How about the other 2 out of 3? Are they not aware of the problems between sales and marketing? This article highlights common problems prohibiting sales and marketing collaboration, summarizes reasons one group thinks the other is the antagonist, and suggests solutions to narrow the divide between sales and marketing. Do any of these examples typify your sales and marketing groups? C-level executives must recognize problems standing in the way of sales and marketing alignment. We took an opportunity to pull together five major problems impeding sales and marketing collaboration. Each problem is backed by data from industry experts. There’s no single recipe for aligning sales and marketing; however, the first step is recognizing they’re not aligned (you already have a 38% chance). Here are some suggestions to align sales and marketing teams which will address the five major problems identified above. 1. Transform your sales cycle into an integrated revenue cycle. Create a new model (definition) for your sales pipeline to include sales, marketing, services and support. We discussed how businesses can split their sales pipeline into a marketing and sales pipeline respectively in this article. Once the sale is made, even more collaboration should occur between sales and marketing while pulling in support and services. We discuss extending your pipeline past the point of “customer” in this article. Working on a revenue cycle vs. a sales cycle allows sales and marketing teams to work together on a common goal; creating revenue, faster. 2. Define a Service Level Agreement (SLA) between marketing and sales. Include things like definitions/terminology, what makes a qualified lead, priority of lead sources, how leads are “recycled” into nurturing programs, where marketing collateral is stored and details of nurturing programs in your SLA. 3. Establish a closed loop reporting process for leads. Once marketing provides a lead to sales it’s crucial follow up is measured and tracked. Marketing automation uses lead distribution technology to disseminate leads based on pre-defined criteria. Automatic lead distribution reduces turnaround time and make sales happier when marketing responds quickly. Additionally, marketing automation technology can automatically schedule follow up actions. For example, scheduling tasks such as a phone call or email in a CRM system such as Salesforce.com. Advanced marketing automation schemes include the ability to ensure tasks are changed or closed; if not, the system will send an email to the marketer or management notifying them of the delay. 4. Foster a culture of respect and trust. To overcome common misconceptions, as highlighted above, foster an environment of collaboration, open communication, and mutual interest to develop respect and trust between marketing and sales. 5. Implement lead scoring. Lead scoring measures a lead’s interaction with marketing activities. It’s an automatic way for marketing to qualify leads for sales. When a lead is qualified by hitting or exceeding a certain scoring threshold, marketing can hand the lead off to sales. The hand-off occurs automatically and unobtrusively. Check out our lead scoring solutions guide for more information. 6. Implement lead tracking. For the 90%+ website visitors who don’t fill out a form, lead tracking captures the visitor’s information as well as their click pattern (digital behavior) as they traverse your site. This is invaluable information for sales. It helps sales better understand what their prospect is interested in. When sales communicates with the prospect they’ll know what they’re looking for resulting in a more efficient discussion. If lead tracking is not implemented sales loses out on more leads and marketing doesn’t get the proper return on their marketing investments. 7. Implement closed-loop email marketing. Typically, marketing will collect a bunch of leads from a trade show, send out an email blast, then hope for someone to call back. With closed-loop email marketing, any response to an email message is automatically signaled to sales or scored appropriately. The marketing system will “raise its hand” when prospects are interested. Closed-loop email marketing is built into most marketing automation solutions. 8. Implement lead nurturing. Don’t let 90% of your marketing collateral (major marketing investments) go to waste. Lead nurturing leverages closed-loop email marketing and enables marketers to setup customized nurturing schedules of 1, 3, 6, 9, 12, or any number of months to automate and personalize the process of staying in touch with your leads. With marketing collateral in hand, a nurturing program, and closed-loop email marketing you can automate periodic follow up. The nurturing system will automatically send email messages with attached collateral matching your prospects interest. Nurturing matures the prospects interest until they’re ready to buy. Lead nurturing also makes sure that the 80% of ignored leads are not ignored since marketers can drop them into a lead nurturing cycle right away. For the 73% of marketers that don’t plan to revisit/re-qualify leads, work with sales to establish a process wherein leads are “recycled” or added back into the nurturing program if the purchase period is farther out than the sales person is ready for. 9. Overlap payment metrics between sales and marketing. Sales people make most of their money off of bookings or revenue. Measure part of marketing’s success on similar sales metrics. 10. Bring in revenue generation software. Get your organization on a common tool set that provides lead generation, marketing automation and sales prospecting capabilities tied into your CRM system. Using a platform solution, not a single product, provides cost savings across the org while uniting your teams. What happens when sales and marketing are aligned? We welcome your feedback, comments and suggestions. What do you feel the problems are between sales and marketing? What solutions do you have to achieve sales and marketing alignment? (*1, *2) “Gauging the Cost of What’s Lost” by the Business Performance Management Forum and CMO Council. (*3) Marketing Sherpa’s 2011 B2B Marketing Benchmark Report. (*4, *6) “The New Rules of Sales Enablement” by Jeff Ernst. (*7) Hugh Macfarlane, founder and CEO of MathMarketing, conducted an alignment benchmarking study by surveying 1,400 professionals in 84 countries around the world. Whether we admit it or not, everyone can learn something new especially when it comes to sales. We sat down with our team to draw from the 100+ people years of sales experience. Through the years we’ve all collected some useful tips, tricks and best practices from sales experts. We culminated these ideas into a list of sales tips for business to business (B2B) sales. This is the first installment of our Sales Tips series. When you’re in a face-to-face meeting with a prospect it’s good to know who was in your meeting when it’s time to follow up. We’d estimate about 60% of the time the people in the meeting don’t have a business card with them. This is especially true in technical meetings. You’d be lucky if the Engineer handed you their last business card crinkled up in their wallet. As a handy tip, give the person your business card, flip it over to the blank side, then ask them to throw their contact information on the back so you know who’re you’re talking to. They’ll always do it, it would be rude not to. Now you’ve got their phone and/or email for follow up and you’ve taught them to bring their cards next time. In today’s internet-age we’re inundated with real-time communication devices such as tablets and mobile phones. The availability of communication devices makes it’s easier to use electronic communication such as text, chatting, or emailing over talking. Don’t lose sight of how business people used to communicate “back in the day”, over the good old telephone. Resist temptation to send an email to a client or prospect. Digital communication lacks feeling, tonality and full-duplex communication – its 1s and 0s and nothing in between. Pick up the phone and make a call. You might learn something else you couldn’t learn from sending an email. Sales wins usually don’t happen overnight, unless the occasional blue bird comes in. The information-age drives businesses to publish content on the web, which enables your clients and prospects access to more data and research. More research stretches out sales cycles. Develop a process to nurture your leads. Enlist help from marketing to tag team efforts and leverage technology such as lead nurturing to automatically stay in touch with your prospects to keep your funnel active. We’re all human, unless you’re working with a “sales machine” – we know a few. Our human nature is to work in groups/packs with people we’re familiar with. The next time you’re in a meeting with a client or prospect watch where their employees site. They’ll usually sit together on the same side of the table. Break up the party, before everyone sits down grab a seat next to the first person that sits down, not your colleague. If you’re traveling with colleagues ask them to sit across from you or next to another employee of your client/prospect. Breaking up groups will drive more interaction during your meetings. As sales people, we tend to speak more than we listen. God gave us two ears and one mouth for a reason. Listen more than you speak, especially in the first meeting. Prior to the meeting remind yourself you’ll let your prospect talk first. You’ll come off as easy going and demonstrate strong listening skills. Most people love to talk about themselves or their situation. Seize the opportunity and give your clients the floor first. Grabbing a business card (even if it’s your own), using the phone, nurturing prospects, choosing seats wisely, and letting prospects speak first are five sales tips to consider. Our goal is to continue to publish sales tips in groups of five as part of this series. Each tip may not apply to you, but we hope you can take away at least one thing. We welcome your feedback, comments and suggestions. What are your sales tips? Interestingly, marketing segmentation is not listed in Wikipedia – the mother of all definitions. However, Wikipedia does define “market segment” as “a sub-set of a market made up of people or organizations with one or more characteristics that cause them to demand similar product and/or services based on qualities of those products such as price or function.” Marketing segmentation and market segmentation are different. Marketing segmentation is, well, a way to segment your marketing, not a market. It’s time we gave marketing segmentation a definition. Here’s our definition, marketing segmentation is the process of individualizing marketing efforts to a subset of targeted contacts or companies meeting related criteria. In plain English, it means marketing to sections of your database to address specific, and like needs. Using email marketing as an example, without marketing segmentation businesses would send out spray and prey email campaigns to every contact in their database. Recipients would become annoyed as they’d receive irrelevant content too frequently that doesn’t meet their needs. To achieve marketing segmentation, businesses should do two things. First, turn to their most valuable asset, their database, and compartmentalize it. Second, split up their sales pipeline into two separate pipelines, one for marketing and one for sales. Let’s first look at compartmentalizing your database. If you have a clean and accurate database you can probably skip this paragraph. However, if you’re like most companies and have an immature or messy database, take the time to get it in order. Your database is the foundation for your marketing segmentation strategy. To clarify, database segmentation is different from marketing segmentation. Database segmentation is a part of the overall marketing segmentation solution and helps you send more personal emails while avoiding unnecessary ones. Once your database is segmented, create unique and relevant content to send to each segment. Before segmenting your database, it helps to make a list of how you’ll market to your database. When you understand how you’ll market to your database you’ll know what database information or fields you’ll need for segmentation. Reference our article 101 ideas for B2B lead generation to spark your thoughts. For this article, let’s assume we’ll use email marketing as our marketing strategy. Next, identify your segmentation criteria. Here are 16 examples of how to segment your database. Interest-based preferences – does the prospect/customer like product A or product B? does your prospect/customer like information on products, use cases, documentation? These are just a few examples. Use interest-based questions in your web forms to collect data. Title – is the prospect/customer a Vice President or in Engineering? Referred by – was it a partner who referred the contact to you? Source – did the lead come from a tradeshow, purchased list, internet search? Clicked links – has the prospect/customer clicked any links in your email campaigns sending them to your company website? This indicates interest. Geography / territory / time zone – where is the prospect/contact located? Recency – was the contact added to your database within the last 3, 6, 9 or 12 months? Networking – where did you meet the prospect/customer, at a restaurant, trade show, on-site? Frequency – who is buying more frequently than others? Separate these folks from the rest of the pack to hone your selling efforts. Monetary – which customers are spending the most? Push them to the top of your stack. Pareto’s Principle of 80/20 – Pareto state’s that for many events, approximately 80% of the effect comes from 20% of the causes. Identify which customers bought something in the past year and what they paid. Figure 80% of the total sales for the year and determine which customers contributed that amount; these are your “A” customers. Next, identify the next 10%; these are your “B” customers. Identify the next 10%; these are your “C” customers. Mark everyone else a “D”. Ignore the Cs and Ds and focus your sales and marketing efforts on the As and Bs. Buyers by Product – who’s buying and who’s not? which products are they buying? Sales stage – where is lead/customer at in your sales and marketing efforts? Feel free to use our article on the sales pipeline to get some ideas of the pipeline stages to use in your database. Lost business – which opportunities have been lost? Don’t forget about them, they may have other projects or interests. You’ve invested a lot of time and energy trying to sell to them. Don’t let that go to waste. Most marketing automation solutions have built-in technology to help you partition your database into individual contact lists by running a query on your database. The query can be a one-time query only or an ongoing query that adds new contacts to your list as they appear in your database and match your requirements. The second step to marketing segmentation is to split the sales pipeline into two separate pipelines. We’ve gone into depth on this topic already so we won’t repeat ourselves. Read this article on dividing your sales pipeline for more information. In summary, sales will manage a pipeline of leads, contacts, and opportunities ready to talk whereas marketing will manage everyone before they’re ready to talk. Marketing’s pipeline is most likely interested in getting an education vs. a sales pitch. Once your contact lists and pipeline process is separated, create unique and relevant marketing assets (whitepapers, kits, email messages, etc.). Finally, leverage closed loop email marketing to send personalized email messages and nurture your lists using lead nurturing technology. Good luck with your marketing segmentation efforts. Special thanks to Lori Feldman, the Database Diva, for providing her list of ideas for database segmentation. However, there’s only one thing missing – how do you do it? The three keys are great principles to live by but without help, these principles will go by the wayside. Turn to technology for assistance. Revenue generation software contains a number of technology components such as lead scoring, marketing automation, lead nurturing and follow-up to build a systematic structure around these three principles. Technology doesn’t discriminate. Use lead scoring technology to automatically qualify inbound leads or leads that exist in your database based on a pre-established set of rules, created by your organization. Lead scoring creates an objective measure on how hot, or not, a lead is. Sometimes the definition of a lead is arbitrary and disputed between sales and marketing. Use technology can keep your lead generation process consistent. This is very true. Luckily, revenue generation software can help again. Most revenue generation software solutions include lead capture. Lead capture adds prospects to your pipeline based on the interest levels you care about. For example, if a contact in your database is sent an email every three months and they finally open an email nine months later, they might be interested. Technology can flag their interest and notify the appropriate sales person in real-time. The use of technology removes the need for sales people to “pull” leads. They should be able to have leads “pushed” to them. Revenue generation software includes email marketing, lead generation, lead capture, web form creation, landing page creation, sales prospecting and more to help sales and marketers implement their strategies. Look for solutions that provide a “platform”, not just a single product. When marketers standardize on revenue generation technology they create marketing factories that are open 24-7, produce consistent output, and provide a framework for operation. Revenue generation software includes lead nurturing technology to establish periodic, scheduled follow up with prospects. Together with sales, marketers can develop 6, 12, 24 or any number of months of a nurturing program that spaces out follow up and touch point activities with your prospects. It’s easy for a sales person to discount a lead after the first few phone calls. The lead shouldn’t be dismissed; rather, nurtured and added back to the periodic follow up cycle. Lead nurturing automatically schedules touch points, handles the “recycling” of your leads, and schedules actions (call/email for example) for sales in a consistent manner ensuring patience, persistence, and follow-up. In summary, revenue generation software technology includes components such as lead scoring, marketing automation, lead nurturing, lead capture and follow-up to build a systematic structure that ensures lead generation success. Sales pipeline, sales cycle, pipeline and revenue cycle are just a few terms thrown around in sales and marketing organizations across the globe to define the life cycle of a sale. There’s no single name for opportunities moving from initial contact to customer. In fact, the health care industry adds to the confusion by defining a revenue cycle as “all administrative and clinical functions that contribute to the capture, management and collection of patient service revenue” according to fairview.org , terminology far different from what’s used in B2C and B2B sales. Putting health care aside, let’s keep it simple and use the traditional name of a “sales pipeline”. Although the name is inconsistent, what is consistent is the mismanagement of the sales pipeline. Organizations should focus on three best practices to better manage their sales pipeline; define the sales pipeline, split the sales pipeline, and keep the sales pipeline/database clean. First, let’s get on common ground. The sales pipeline typically consists of four stages; inquiry, lead, opportunity and customer. Inquiry and “contact” can be used interchangeably. The idea is the name is a new or existing contact in your database. At some point the contact becomes a lead and ready for sales. Then, the lead progresses to an opportunity and eventually a customer. Sit down with leaders of your organization from sales, marketing and operations. Take input from the sales force and come up with a definition for your sales pipeline. The definition should be a collection of stages in conjunction with probability. Probability is your confidence level the lead will close. Use a CRM system such as Salesforce.com to help track the life cycle of your lead as they advance through each stage. Below is an example of the stages and probability of a sales pipeline. The above stages breaks down the sales pipeline beginning with the lead stage into a more granular view, which is recommended. Taking a more granular view on the pipeline stages prior to the lead stage we discover “hidden” stages that must be addressed, added in green in the diagram below. Many sales and marketing organizations disagree on the definition of a lead. Sales tend to have criteria for a lead and marketing tends to call any contact a lead. The definition of a “lead” is not as important as the definition of a “qualified lead”. Sales people are one of the most expensive assets in any organization. Businesses should use their time efficiently by having them focus on the most qualified leads. Marketing provides leads and sales closes them. In effect, there are two pipelines; a marketing pipeline and a sales pipeline. 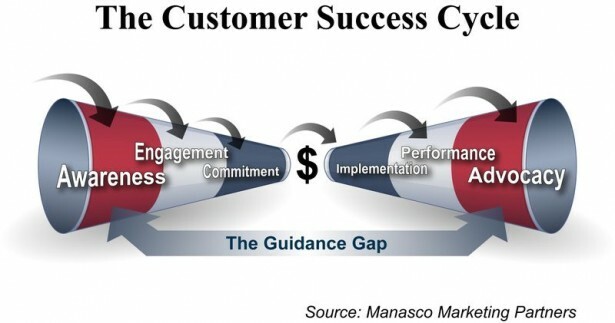 The Marketing pipeline is manages the customer touches from initial contact through to a real sales lead. Marketing must offer education and not appear as high pressure or “salesy”, which is a turn-off in the beginning stages. Marketing should make sure that by the time sales contacts the prospect; the prospect is open to having a conversation. Assuming 60 points is the hand off threshold; marketing will handle all stages of the pipeline until the lead reaches 60 points. At that point sales picks up the qualified lead to progress them through the stages, again as defined in suggestion #1 above. Sales may deem the lead as unqualified but should not dismiss the lead and remove them from the pipeline. The lead should be passed back to marketing, or “recycled”, for more nurturing. The result is a tightly sealed sales and marketing pipeline that optimizes revenue generation. To properly manage your sales pipeline you must keep your database efficient and clean. Reduce resistance of data entry by simplifying the number of fields in your database. Think about what fields are a must have vs. a nice to have. Use technology to automate the process of data completion. For example, if you know the name of the business there are tools to pre-fill revenue, number of employees, competitors and more. Finally, make sure to have some sort of “Do Not Call” or “Opt-Out” category for each of the contacts in your database. This is a simple way to demarcate leads that should be sent to the graveyard.